Esteves Motorcycle Design (EMD) has launched a transatlantic motorcycle raffle which will see two customized Sportsters given away. For Europe, EMD has partnered with Custom Chrome Europe, Odyssey Motorcycles, Racing Republic and Freeway magazine, while in the USA its partners include HardDrive and Bikernet.com. One of the bikes, nicknamed Root Beer, is a brand new Sportster Iron 883 fully equipped with the best of EMD's cast aluminum engine covers and dress up accessories. The second machine, WTF is a one-off chopper that's built around a 1200 Harley-Davidson Sportster. 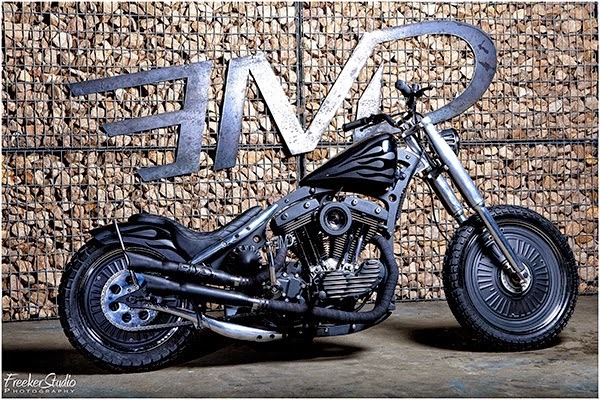 It features a unique multi-blade steel frame with rear arm loops made from billet aluminum and a host of EMD accessories. European entrants can purchase tickets at www.estmd.com and those in North America should visit www.emd-part-usa.com for a chance to win one of the two customized Sportsters. The winning ticket will be picked May 9, 2015 at Eurofestival during the Chopper and Co party in Cogolin, France. The bikes can be claimed in France or in California.